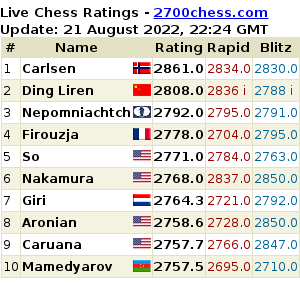 Search after any text in the FIDE rating file (Download)! 'All Federations' must by highlighted to search through all federations! Case insensitive ignores upper-case letters ! Replace unknown letters and BLANKs with a DOT '.' ! players, but not the players that have "ger" in their names ! A search after "|2529|" will show you all players with an ELO of 2529. A search after "|27..|" gets you all players with Elo 2700 to 2799.